Stormwater treatment cells capture and treat runoff in a design concept for the Croton Water Filtration Plant, New York City’s first filtration plant. The plant is covered by a 9-acre green roof that includes a driving range and a network of treatment wetlands. The project team included Grimshaw Architects, WORKSHOP: Ken Smith Landscape Architect, and Great Ecology. Ecologists build models—not 3D models like those we construct to envision built work, but mathematical and algorithmic models that predict the outcome of a given set of ecological conditions. These models provide one of the best foundations upon which we can develop our designs. Detailed quantitative and qualitative analyses and projected outcomes can inform our design process and maximize the potential for ecological uplift—the net gain in ecological function between existing and proposed conditions. Functional assessments that measure the relative health of a specific habitat or landscape also provide valuable data for driving the design process. Rapid assessment tools like the Hydrogeomorphic Method, or HGM, and the Evaluation for Planned Wetlands, or EPW, facilitate efficient analyses of a wetland’s ecological functionality. The EPW is particularly relevant for designers because it evaluates an existing plan or design, compares it to a reference site, and assigns scores based on a range of metrics. The scores expose the weakest aspects of the design’s potential to achieve ecological uplift, and the EPW includes design guidelines for increasing that potential. Additional assessment tools, such as the Stream Visual Assessment Protocol, or SVAP, and Habitat Equivalency Analysis, or HEA, can be utilized in similar ways to evaluate riparian and upland ecosystems, respectively. Translating the results of data analyses and functional assessments into design solutions requires interpretation and adaptation. Ideally, this stage in the process is not linear; cyclical iterations of interpretation, conceptual design, analysis, and revised conceptual design produce alternatives that balance science, art, and culture. Design adapts to meet disparate objectives, and the built work continues to adapt well past project close-out. 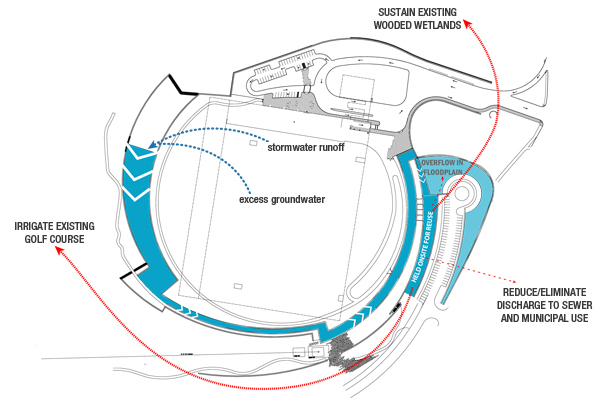 Sections depicting proposed ecological improvements for a brownfield site communicate the range of potential benefits in ecosystem services and public amenities. Of course, many projects lack the necessary budget and/or motivation to complete rigorous scientific analyses. In such situations, landscape architects can apply the core principles of the ecological approach in the most appropriate manner possible. In doing so, we set the stage for successful establishment of functional habitat. Project scales, programs, and objectives vary widely, but below are some basic practices to consider to increase ecological value. 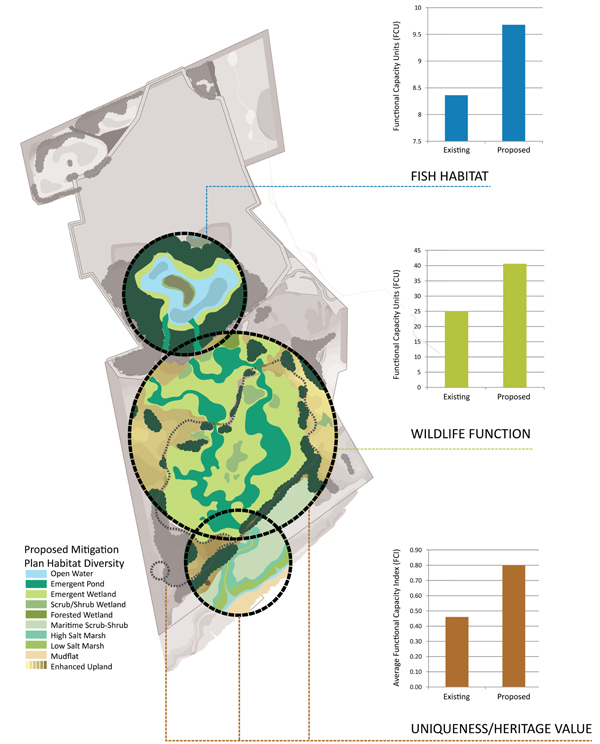 A plan view graphic summarizes the results of an Evaluation for Planned Wetlands for a proposed restoration project. Ecological uplift, or the net gain in ecological function between existing and proposed conditions, is quantified in Functional Capacity Units and Functional Capacity Indices. Public access improvements, such as interpretive trails and wildlife viewing overlooks, increase the Uniqueness and Heritage Value at this former industrial site. 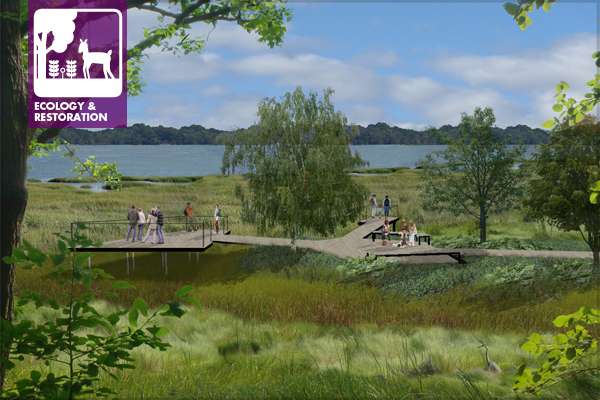 Preserve existing native habitat and drainage patterns through sensitive design solutions. Restore historic habitat and hydrology if applicable and appropriate. Minimize fragmentation of habitat and drainage systems. Incorporate ecological systems into the site plan and infrastructure design from the outset, not merely as an afterthought or topdressing. Design for a multitude of plant and wildlife species. Understand the implications of the project upon pollinators, small mammals, aquatic and amphibious species, birds, and a wide range of native plants. Incorporate design elements that foster a thriving natural system. Consider the context. Assess the impacts of the proposed intervention on the surrounding natural systems. Ecological functions do not stop at property lines. Is there a potential connection? Can the design complete a missing link in a larger system? Maximize on-site connectivity. Capitalize on opportunities to connect planting areas, hydrology, buffers, corridors, greenways, and open space. 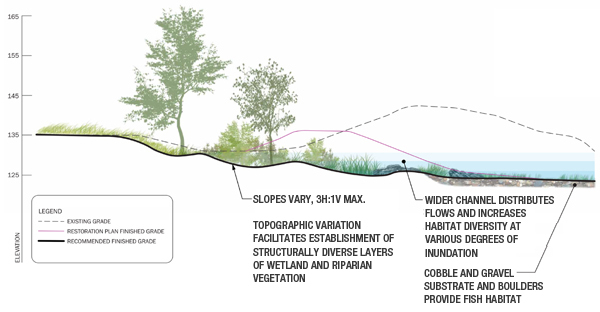 Design landforms that maximize potential for habitat diversity and capitalize on potential to improve water quality. Introduce horizontal and vertical complexity with curvilinear forms that increase ecotone edges and create microtopographical features. Build healthy soils, or salvage and properly manage existing soils to preserve biological integrity during construction. Let the site inform the palette. Choose plants and materials that will thrive and function under existing site conditions. Diversify the plant palette. Even if planting in drifts and layers, include a wider variety of complementary plant species. Add structural diversity. Include a variety of herbaceous and woody plants, including grasses, forbs, shrubs, and trees. Incorporate stormwater BMPs to improve water quality and reduce irrigation demands. Conserve water with efficient planting and irrigation design. Get creative. Break the rules. Often the best solutions lie outside the norm! Ecological assessments can influence the design process. 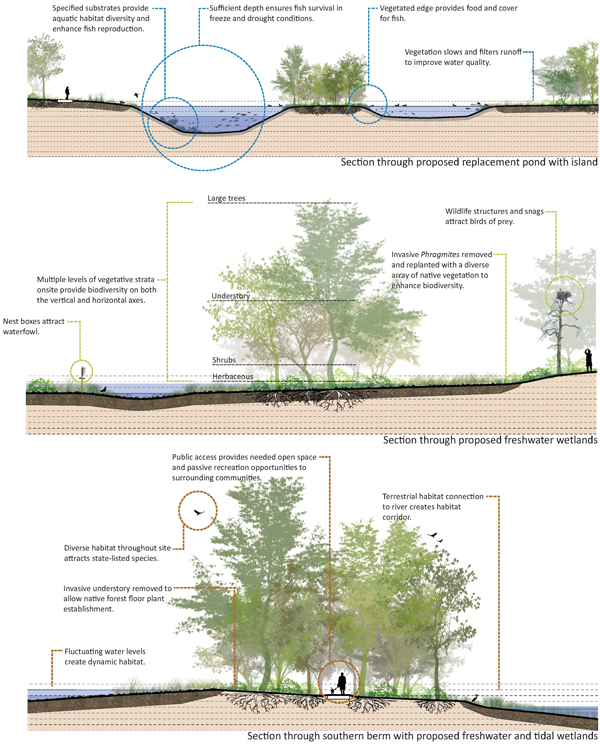 A conceptual design section shows existing grade, designed restoration grade, and a proposed revision to the designed grade to increase ecological functionality in a restored stream channel. This article originally appeared in the 2015 Colorado Design Journal. Previous Article How Did You Discover Landscape Architecture?